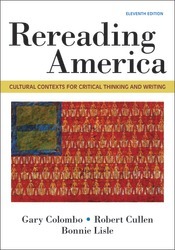 Rereading America remains the most widely adopted book of its kind because it works: instructors tell us time and again that they've watched their students grow as critical thinkers and writers as they grapple with cross-curricular readings that not only engage them, but also challenge them to reexamine deeply held cultural assumptions, such as viewing success solely as the result of hard work. Extensive apparatus offers students a proven framework for revisiting, revising, or defending those assumptions as students probe the myths underlying them. Rereading America has stayed at the forefront of American culture, contending with cultural myths as they persist, morph, and develop anew. The eleventh edition features a refreshed collection of readings with an updated chapter that introduces students to one of the most pervasive myths of our time: technological innovation fosters an improved society. Also in response to instructors' requests for more writing instruction, there are now more questions that help students apply to their own writing the strategies used in the readings.